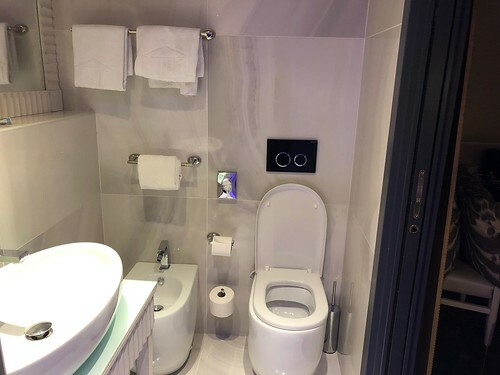 yitzy93's 3-Day Rome Trip Report. First time posting/writing a trip report. All credit to my DW for putting it all together. I would personally never have the patience to write a trip report like this. 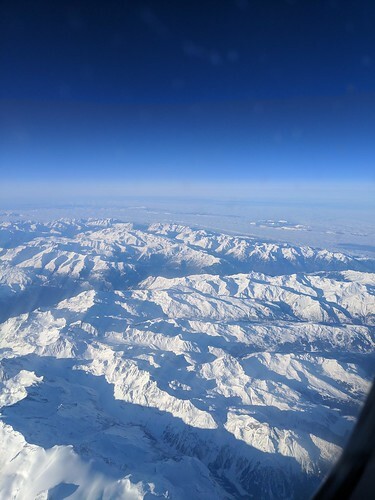 Stunning view of the Alps on the flight to Rome! We arrived in FCO late morning and took our preordered taxi (welcomepickups) to our hotel. The taxi service was very professional, they gave us free bottles of water, maps and a bag for our shopping! It was €48 and took around 45 mins. 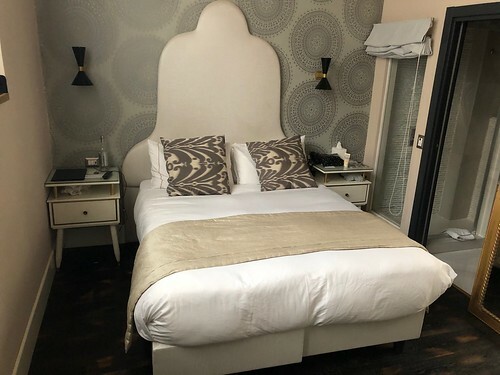 We stayed in the HT6 hotel which is located in the Jewish ghetto; it is really an amazing location to stay in as it is very near the kosher restaurants, most of which are across the street! 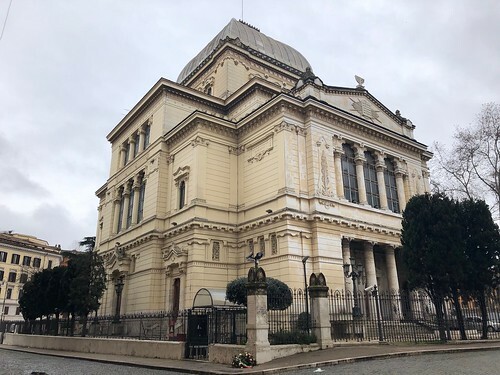 (Like Alice, BaGhetto, Cremeria Romana and Yotvata is a 3 minute walk). It was a very nice, clean hotel and the staff are very eager to please you! We arrived before our room was ready so they kept our suitcase for us until we came back, from a walk around the ghetto and some Alice pizza. We then went back to the hotel and they showed us to our room where our suitcase was waiting for us. They gave us an electric key card (I have heard that they give a normal key if one were to stay for shabbos) and a card for a free welcome drink (either white wine, prosecco or Italian beer) to be used on the day of arrival at their bar which was open from 6pm-midnight. 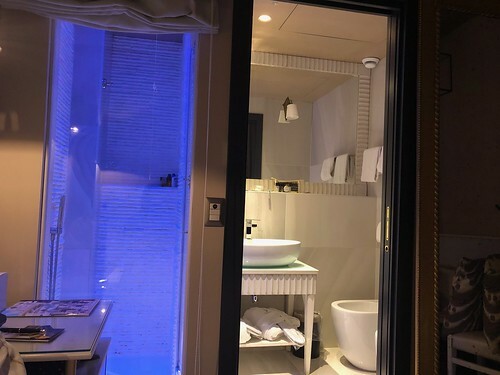 As soon as we went into our room, on the right there was place to hang your clothes, a safe and a fridge, and in front of us was a staircase up to the bed and bathroom. 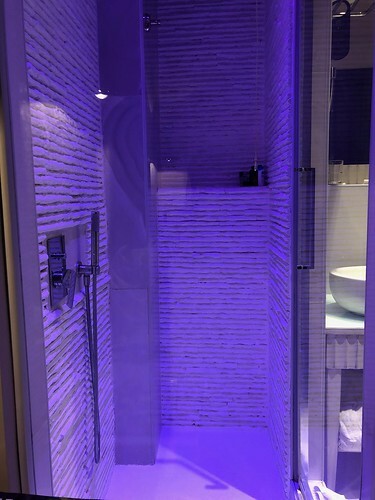 Our room had a chromatherapy shower in it, which is basically a shower with changing coloured lights (I know that there are other rooms available with either a Turkish bath and or or a whirl pool bath/jacuzzi). 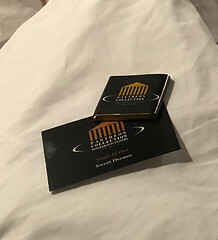 When we came back to the hotel after supper, we noticed that our beds had been turned down, with a chocolate and a card saying sweet dreams, which was a nice added touch. Since the hotel was located in the Jewish ghetto they did offer a few kosher things to eat for breakfast (which needed to be ordered in advance); there was Kellogg’s cornflakes, Maccabi Cholov Yisrael milk (which we had to ask for) kosher bread-from the bakery across the street- croissants (which we also had to ask for), different types of jam and Nutella and there was some fruit. Day 1: When we arrived we walked around the Jewish Ghetto, just to familiarise ourselves with the area and look around (and try out Alice!) We then went back to the hotel to go to our room and unpack. After relaxing a bit we then decided to walk to Vatican City, which took around 30 mins. We walked through a lot of small narrow streets as well as busy streets spotting some famous landmarks along the way. We decided not to go into the Vatican but explored the outside and took photos. 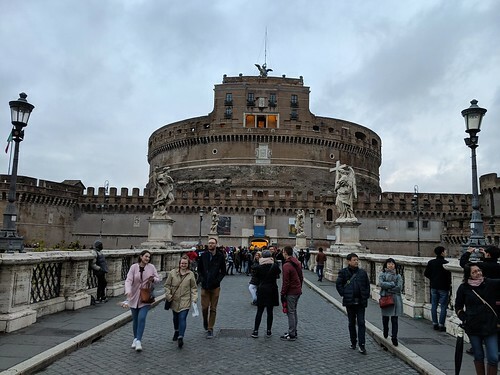 We then walked back to the hotel and stopped off along the way at Castel Sant’Angelo, then went to BaGhetto for supper and Cremeria Romana for dessert! 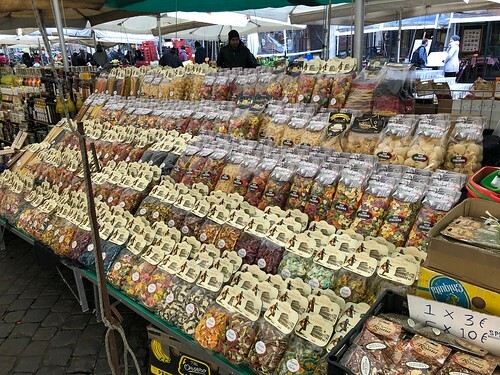 Day 2: After eating breakfast, heading nowhere in particular, we ended up walking to the market at Campo Dei Fiori which was around a 10 minute walk (not including all the stops we made along the way!) There were stalls selling different types of pastas, fruit and vegetables, leather goods and scarves. We then walked back to the ghetto and stopped in Alice (again) for lunch. We had a 3 hour Segway tour (with Italysegwaytours €60 per person) booked for the afternoon so we then headed towards there (around 15 min walk). As it wasn’t busy season we were the only people on the tour. Unfortunately, as soon as we started the tour it started raining heavily, they offered us plastic ponchos to wear over our clothes which we gladly took. It was raining for most of the duration of the tour but was still a good tour nonetheless! Our tour guide was extremely passionate about the Italian history and conveyed everything in full detail (not that we were so interested ). I can’t remember all the places we went to but will try and list as much as I can; Trajan Forum, Colosseum(outside), Arch of Costantine, Circus Maximus, Knights of Malta square(looking through the famous keyhole to see the stunning view! ), Orange Trees Garden with a spectacular, Panoramic view over Rome, Santa Maria in Cosmedin and its Bocca della veritá, Marcello Theatre, Roman Forum and Capitoline Square. Outside the Colosseum we were shown using virtual reality goggles what the Colosseum used to look like and it’s surrounding area. We then walked (the rain had finally stopped) back to the hotel to dry off and warm up! Then we went to Yotvata for supper. Day 3: We checked out of the hotel, (leaving our luggage there) and went to Alice (once again) for an early lunch. Ironically we bumped into David the tour guide, whom we recognised from Dan's trip report! We then headed towards ‘Roma Rent Scooter’ (which was less than a 10 min walk from the hotel) to rent a Classic Italian Vespa scooter to finish off the rest of the sightseeing and to revisit some sights while not in the rain! They were very easy going and we were in and out of there within 10 minutes. We rented the scooter for 3 hours which was €30 (plus we had to fill up €5 gas). It was really a nice, fun way to see the rest of the city! 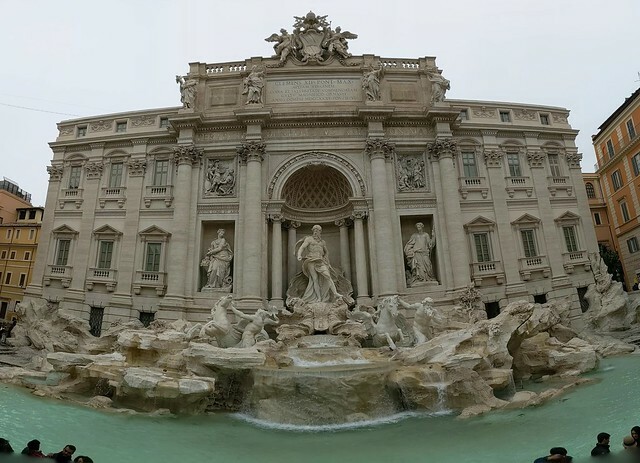 First we rode to Trevi Fountain, parked up and walked around. Then we walked for 7 mins to get to the Spanish Steps. We went back to where we parked and then rode to the Colosseum area and walked around. We then went to fill gas and head back to return the scooter. After walking back towards the ghetto, we went around the small shops near the ghetto and to Alice (for the last time) to get some food for the trip home. I’m going to start off by saying that I am a foodie and enjoy really tasty and good quality food! Obviously everyone has different taste but this was my take on the food! Day 1: For lunch we went to Alice for the first of many times! 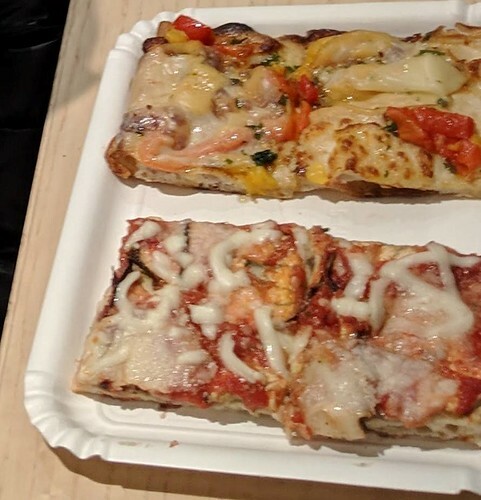 We tried out the tomato sauce, cheese and eggplant pizza as well as the smoked cheese and ‘pepperoni’ pizza. 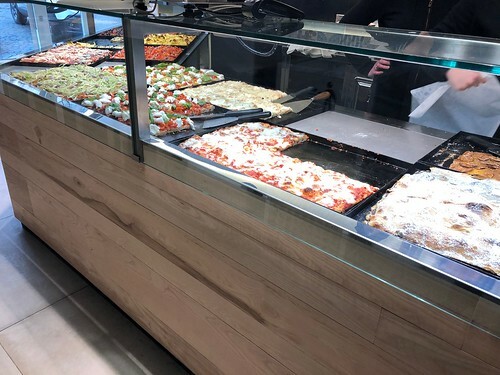 They really do have the most amazingly tasty, mouthwatering pizza! For supper we went to BaGhetto; we sat down basically on the same table as the people next to us and were given some bread in a paper bag (which we were charged for at the end). 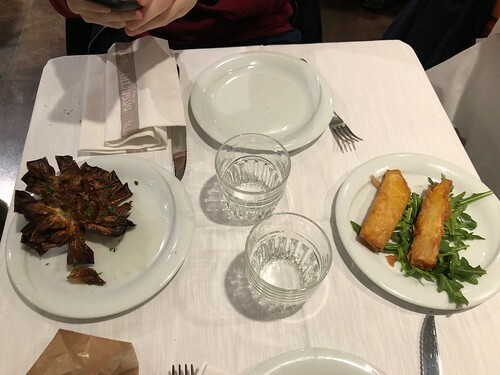 We ordered the Jewish style artichoke (we couldn’t leave without trying the famous artichoke!) and the cigars filled with cheese and potatoes. They were both tasty but I felt that the cigars needed to be served with a sauce. 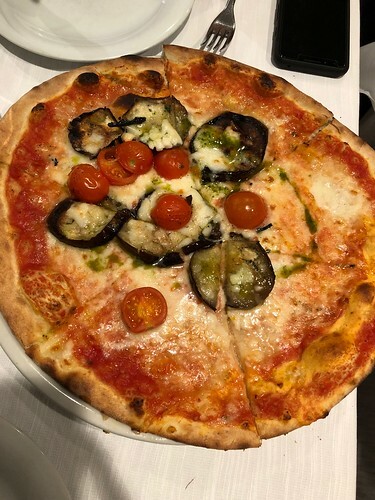 For main we ordered the eggplant and tomato pizza-which had a good crisp base and was tasty but couldn’t compare to Alice!- and the much recommended 4 cheeses and truffle sauce, fettuccine which personally, I didn’t enjoy so much. 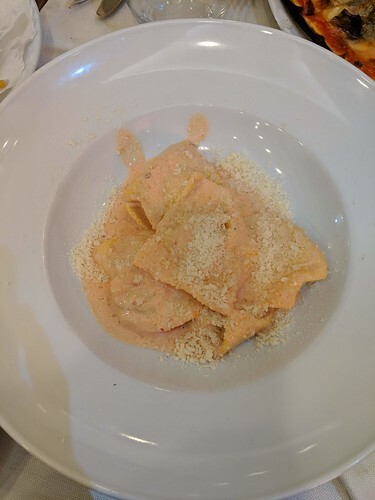 I found it a bit bland and the sauce was a bit dry; I actually didn’t even finish it (which is very rare for me)! 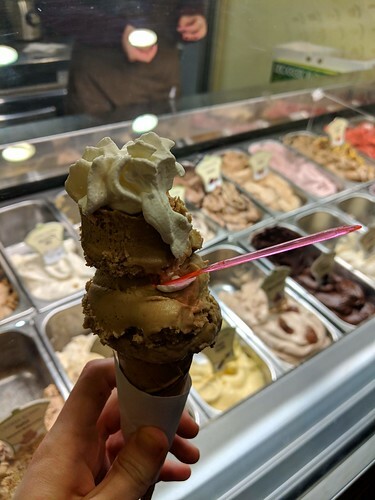 We then went next-door to Cremeria Romana for dessert for some delicious Ice cream! 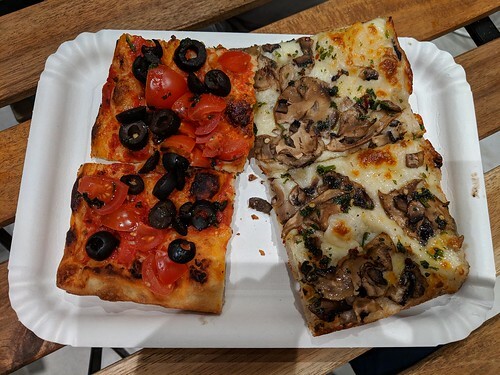 Day 2: We went to Alice again for lunch and had the mushroom and cheese pizza, the tomato sauce and cheese pizza and the tomato sauce, olives and tomatoes pizza all which was all, once again delicious! For supper we went to Yotvata; it was quite empty when we came, which was nice! We were given bread in a basket (which we were charged for) while we waited for our food. 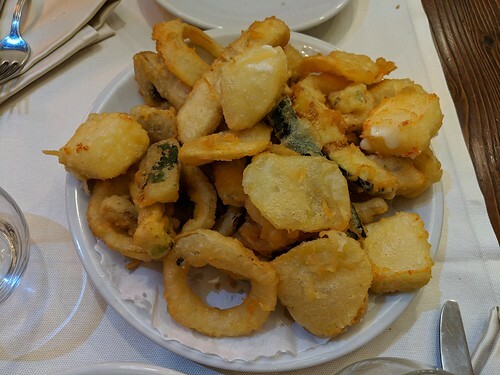 For starters we shared (it was a massive serving) the ‘Fritto Yotvata’ which was really good and tasty although it would have been that much better if they had served it together with a sauce. 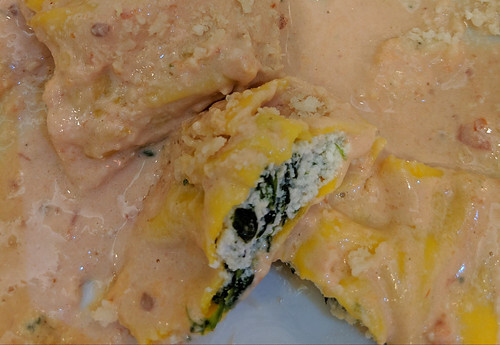 For main we had the ravioli stuffed with spinach and ricotta filling and a Rosa sauce, which was really divine! 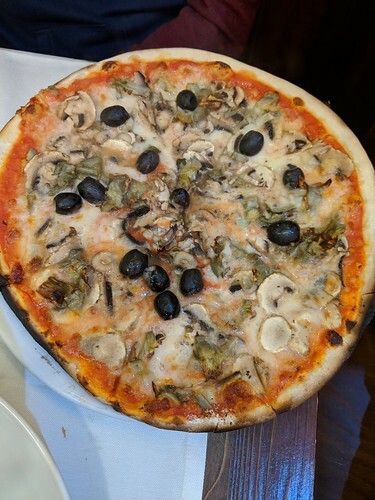 We also had the mushroom pizza with added olives and artichoke, which we found lacked a bit of flavour but had a really good crisp base. So my personal comparison between the much debated BaGhetto and Yotvata is: the seating is better in Yotvata as it’s a more spacious place and there is no one sitting ‘on top of you’. 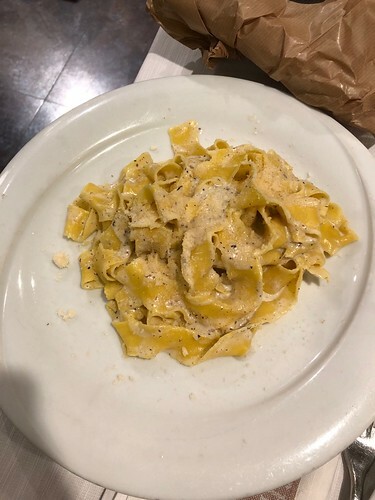 The pizza was better in BaGhetto and the pasta was much better in Yotvata! Day 3: So on the last day we went to Alice 3 times! (Yeah! That's how good it is!) We went for an early lunch and had the tomato sauce, olives and tomato pizza and the tomato sauce and cheese pizza. 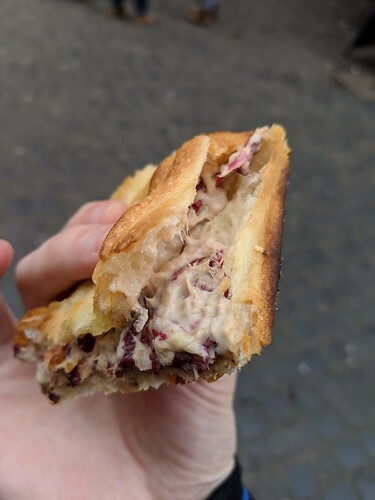 We went back for a snack and we got the tuna and mayo focaccia type of thing as takeaway while we were doing our last rounds of the area, it was so good that we went back half hour later to get more of the tuna focaccia to take with us to the airport! 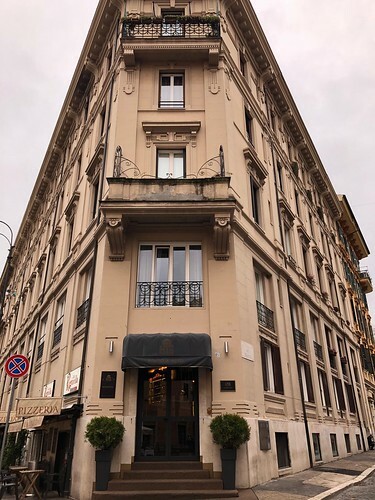 Re: yitzy93's 3-Day Rome Trip Report. Thank you for the TR and pictures, enjoyed reading. Alice pizza is real good!! For supper we went to BaGhetto; we sat down basically on the same table as the people next to us and were given some bread in a paper bag (which we were charged for at the end). Fyi, there's a tax that they charge and can only be passed on if bread (pane) was served (something to that extent). When I was there we didn't even get the bread until we were leaving. It was kinda old too, not really meant to be eaten. The charge shows as "pane" on the receipt, but it's really that tax. That smoked cheese pizza is hands down the best pizza on Earth. Does anyone know if the spiciness in a lot of their pizzas is chives? I was sure it was garlic, but they said there's no garlic on any of them. I never used chives, but from googling a bit I think it may be that. Do you remember how much you paid for the hotel?